Continuity mistake: The white gloves Corrina is wearing standing at the front door of her boss' house appear and disappear. Visible crew/equipment: When Molly spat on the first nanny's face, the woman starts drinking Mr. Singer's martini. As she drinks, a microphone drops down over her head. Continuity mistake: When Corrina leaves Molly's house for the first time, we see her pick an orange off the tree and walk away. She then turns around and tosses the orange to Molly. The next shot of Corrina shows her walking away with another orange in her hand. She only picked one, and threw it to Molly. Molly: My daddy doesn't think she's in heaven. 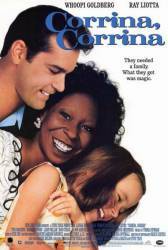 Corrina Washington: Well, that's probably just because your daddy is so jealous of the angels. He's so jealous, he can't even stand to think about those angels who get to play with your mommy all day long. And he's hurting just like you're hurting, and you're going to hurt for a long time. Every day it'll get a little better, but you'll always miss your mommy, and that's okay. Molly: Do you taste like chocolate? Lizzie: I don't know, do you taste like vanilla? Molly: I won the spelling bee today. Manny Singer: You did? Corrina, did you hear that? Corrina Washington: I heard it, now let's go eat, I'm starved. Manny Singer: What was the word? Corrina Washington: Why don't we vacuum ourselves out the door? Manny Singer: How do you spell vacuum? Question: Why does Manny make up excuses about his wife doing something when in reality she died? Chosen answer: Manny is struggling with her death and trying to care for Molly. In a moment of self denial and sadness, he just makes it up in hopes of tricking himself into thinking that everything is normal.